a. Plus trace of Arawak / Carib. Grenada () is an island country consisting of the island of Grenada and six smaller islands at the southern end of the Grenadines in the southeastern Caribbean Sea. Grenada is located northwest of Trinidad and Tobago, northeast of Venezuela, and southwest of Saint Vincent and the Grenadines. Grenada is also known as the "Island of Spice" because of the production of national bird of Grenada is the critically endangered Grenada Dove. On March 17, 1649, a French expedition of 203 men from Seven Years' War in 1762. Grenada was formally ceded to Britain by the Treaty of Paris in 1763. The French re-captured the island during the American War of Independence, after Comte d'Estaing won the bloody land and naval Battle of Grenada in July 1779. However the island was restored to Britain with the Treaty of Versailles in 1783. Britain was hard pressed to overcome a pro-French revolt in 1795–1796 led by Julien Fedon. Nutmeg was introduced to Grenada in 1843 when a merchant ship called in on its way to England from the East Indies. The ship had a small quantity of nutmeg trees on board which they left in Grenada, and this was the beginning of Grenada's nutmeg industry that now supplies nearly forty percent of the world's annual crop. In 1877, Grenada was made a Crown colony. Theophilus A. Marryshow founded the Representative Government Association (RGA) in 1917 to agitate for a new and participative constitutional dispensation for the Grenadian people. Partly as a result of Marryshow's lobbying, the Wood Commission of 1921–1922 concluded that Grenada was ready for constitutional reform in the form of a 'modified' Crown colony government. This modification granted Grenadians the right to elect 5 of the 15 members of the Legislative Council, on a restricted property franchise enabling the wealthiest 4% of adult Grenadians to vote. From 1958 to 1962 Grenada was part of the Federation of the West Indies. Independence was granted in 1974 under the leadership of Eric Gairy, who became the first Prime Minister of Grenada. Civil conflict gradually broke out between Eric Gairy's government and some opposition parties including the New Jewel Movement (NJM). Gairy's party won elections in 1976, but the opposition did not accept the result, accusing it of fraud. In 1979, the New Jewel Movement under Maurice Bishop launched a paramilitary attack on the government resulting in its overthrow. The constitution was suspended and Bishop's "People's Revolutionary Government" (PRG) ruled subsequently by decree. Cuban doctors, teachers, and technicians were invited in to help develop health, literacy, and agriculture over the next few years. Agrarian reforms started by the Gairy government were continued and greatly expanded under the revolutionary government of Maurice Bishop. Members of the Eastern Caribbean Defence Force during the invasion of Grenada. On October 19, 1983, Bernard Coard and his wife Phyllis, backed by the Grenadian Army, led a coup against the government of Maurice Bishop and placed Bishop under house arrest. These actions led to street demonstrations in various parts of the island. Bishop had enough support from the population that he was eventually freed after a demonstration in the capital. When Bishop attempted to resume power, he was captured and executed by soldiers along with seven others, including government cabinet ministers. The Coard regime then put the island under martial law. After the execution of Bishop, the People's Revolutionary Army (PRA) formed a military government with General Hudson Austin as chairman. The army declared a four-day total curfew, during which (it said) anyone leaving their home without approval would be shot on sight. The overthrow of a moderate government by one which was strongly pro-communist worried U.S. President Ronald Reagan. Particularly worrying was the presence of Cuban construction workers and military personnel who were building a 10,000-foot (3,000 m) airstrip on Grenada. Bishop had stated the purpose of the airstrip was to allow commercial jets to land, but U.S. military analysts argued that the only reason for constructing such a long and reinforced runway was so that it could be used by heavy military transport planes. The contractors, American and European companies, and the EEC, which provided partial funding, all claimed the airstrip did not have military capabilities. Reagan was worried that Cuba – under the direction of the Soviet Union – would use Grenada as a refueling stop for Cuban and Soviet airplanes loaded with weapons destined for Central American communist insurgents. 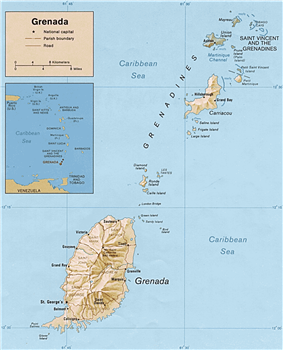 On October 25, 1983, combined forces from the United States and from the Regional Security System (RSS) based in Barbados invaded Grenada in an operation codenamed Operation Urgent Fury. The U.S. stated this was done at the behest of Prime Minister Eugenia Charles of Dominica. While the Governor-General of Grenada, Sir Paul Scoon, later stated that he had also requested the invasion, it was highly criticised by the governments of Britain, Trinidad and Tobago, and Canada. The United Nations General Assembly condemned it as "a flagrant violation of international law" by a vote of 108 in favor to 9, with 27 abstentions. The United Nations Security Council considered a similar resolution, which failed to pass when vetoed by the United States. After the invasion of the island nation, the pre-revolutionary Grenadian constitution came into operation once again. Eighteen members of the PRG and the PRA (army) were arrested after the invasion on charges related to the murder of Maurice Bishop and seven others. The eighteen included the top political leadership of Grenada at the time of the execution as well as the entire military chain of command directly responsible for the operation that led to the executions. Fourteen were sentenced to death, one was found not guilty and three were sentenced to forty-five years in prison. The death sentences were eventually commuted to terms of imprisonment. Those in prison have become known as the Grenada 17. When U.S. troops withdrew from Grenada in December 1983, New National Party under Keith Mitchell who went on to win the 1999 and 2003 elections and served for a record 13 years until 2008. 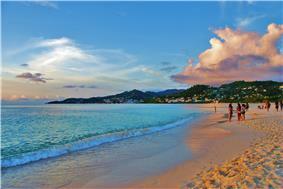 Grand Anse Beach, St. George. ecotourism is growing in significance. Most of these small ecofriendly guesthouses are located in the Saint David and Saint John parishes. The tourism industry is increasing dramatically with the construction of a large cruise ship pier and esplanade. Up to four cruise ships per day were visiting St. Georges in 2007–2008 during the cruise ship season. Devastation in Grenada caused by Hurricane Ivan. Grenada is a leading producer of several different spices. Cinnamon, cloves, ginger, mace, allspice, orange/citrus peels, wild coffee used by the locals, and especially nutmeg, providing 20% of the world supply, are all important exports. The nutmeg on the nation's flag represents the economic crop of Grenada; the nation is the world's second largest producer of nutmeg (after Indonesia). Grenada is a full and participating member of both the Organisation of Eastern Caribbean States (OECS). On February 19, 2013, Prime Minister Keith Claudius Mitchell, 65, led the New National Party (NNP) to victory with a clean sweep of 15 seats. Mitchell was sworn into office on February 21 and is the country's ninth prime minister since it attained political independence from Britain in 1974. As a Commonwealth realm, Queen Elizabeth II is Queen of Grenada and Head of State. The Crown is represented by a Governor-General, currently Cécile La Grenade. Day-to-day executive power lies with the Head of Government, the Prime Minister. Although appointed by the Governor-General, the Prime Minister is usually the leader of the largest party in the Parliament. The islands are of volcanic origin with extremely rich soil. Grenada's interior is very mountainous with Mount St. Catherine being the highest at 840 m (2,760 ft). Several small rivers with beautiful waterfalls flow into the sea from these mountains. The climate is tropical: hot and humid in the rainy season and cooled by the trade winds in the dry season. Grenada, being on the southern edge of the hurricane belt, has suffered only three hurricanes in fifty years. The island of Grenada is the largest island in the Grenadines; smaller islands are Grenville and Gouyave. The largest settlement on the other islands is Hillsborough on Carriacou. 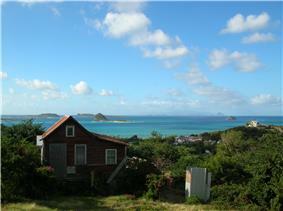 A view of Carriacou, with other Grenadine islands visible in the distance. In April 2007, Grenada jointly hosted (along with several other Caribbean nations) the 2007 Cricket World Cup. The Island's Prime Minister was the CARICOM representative on cricket and was instrumental in having the World Cup games brought to the region. After Hurricane Ivan, the government of the People's Republic of China (PRC) paid for the new $40 million national stadium and provided the aid of over 300 laborers to build and repair it. During the opening ceremony, the anthem of the Republic of China (ROC, Taiwan) was accidentally played instead of the PRC's anthem, leading to the firing of top officials. On September 7, 2004, after being hurricane-free for forty-nine years, the island was directly hit by Hurricane Ivan. 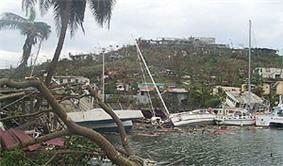 Ivan struck as a Category 3 hurricane and damaged or destroyed 90% of the island's homes. On July 14, 2005, Hurricane Emily, a Category 1 hurricane at the time, struck the northern part of the island with 80-knot (150 km/h; 92 mph) winds, causing an estimated USD $110 million (EC$297 million) worth of damage. By December 2005, 96% of all hotel rooms were open for business and to have been upgraded in facilities and strengthened to an improved building code. The agricultural industry and in particular the nutmeg industry suffered serious losses, but that event has begun changes in crop management and it is hoped that as new nutmeg trees gradually mature, the industry will return to its pre-Ivan position as a major supplier in the Western world. The island has also pioneered the cultivation of organic cocoa which is also processed into finished bars by the Grenada Chocolate Company. Tourism is concentrated in the southwest of the island, around St. George, Grand Anse, Lance Aux Epines, and Point Salines. Grenada has many idyllic beaches around its coastline including the 3 km (1.9 mi) long Grand Anse Beach in St George which is considered to be one of the finest beaches in the world and often appears in countdowns of the world's top ten beaches. Flights at the Maurice Bishop International Airport connect with other Caribbean islands, the United States, Canada, and Europe. There is also a daily fast ferry service between St. George and Hillsborough. Beginning in October 2009 new passenger ferry service between Grenada, Barbados, St. Vincent, St. Lucia, and Trinidad provided by Grenada-based BEDY Ocean Line is scheduled to begin. However, as of January 2013, this service has not gone operational. 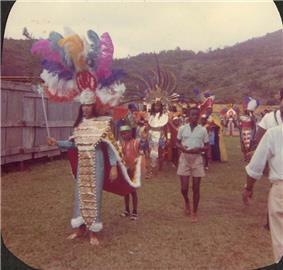 A majority of Grenadine citizens (82%) are descendants of the African slaves brought by the English and French; few of the indigenous Carib and Arawak population survived the French purge at Sauteurs. A small percentage of descendants of indentured workers from India were brought to Grenada mainly from the North Indian states of Bihar and Uttar Pradesh between May 1, 1857 – January 10, 1885. Today, Grenadians of Indian descent comprise the second largest ethnic group. There is also a small community of French and English descendants. The rest of the population is of mixed descent (13%). 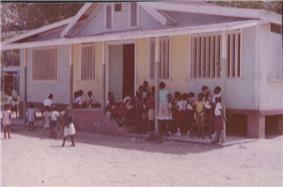 A school on Grand Anse beach. Grenada, like many of the Caribbean islands is subject to a large amount of migration, with a large number of young people wanting to leave the island to seek life elsewhere. With 110,000 people living in Grenada, estimates and census data suggest that there are at least that number of Grenadian-born people in other parts of the Caribbean (such as Barbados and Trinidad) and at least that number again in First World countries. Popular migration points for Grenadians further north include New York City, Toronto, the United Kingdom (in particular, London and Yorkshire; see Grenadians in the UK) and sometimes Montreal, or as far south as Australia. This means that probably around a third of those born in Grenada still live there. The official language, English, is used in the government, but Grenadian Creole is considered the lingua franca of the island. French Patois (Antillean Creole) is also spoken by about 10%–20% the population. Some Hindi/Bhojpuri terms are still spoken amongst the Indian descendants, mostly those pertaining to the kitchen; such as aloo, geera, karela, seim, chownkay, and baylay. The term bhai, which means 'brother' in Urdu and Hindi, is a common form of greeting amongst Indo-Grenadians males of equal status. Including a small community of Rastafarians living in Grenada, most of the population belong to Christian churches. About half of the population are Roman Catholic; while the largest Protestant denomination is Anglican, with Presbyterian and Seventh Day Adventist taking up much of the remainder. Most churches have denomination-based schools but are open to all. There are a small Hindu and Muslim populations descended mostly from Gujarati Indian immigrants who came during the colonial period and set up merchant shops. English is the country's official language, but the main spoken language is either of two English-based creole languages (Grenadian Creole English and Grenadian Creole French) which reflects the Indian, African, and European heritage of the nation. The creoles contain elements from a variety of African languages; Grenadian Creole, however, is also influenced by French. Grenadian Creole French is mainly spoken in smaller rural areas, but today it can only be heard in a few small pockets of the society. Grenadian Creole French is mainly known as Patois or Kwéyòl. Although French influence on Grenadian culture is much less visible than on other Caribbean islands, surnames and place names in French remain, and the every day language is laced with French words and the local dialect, or Patois. Stronger French influence is found in the well seasoned spicy food and styles of cooking similar to those found in New Orleans, and some French architecture has survived from the 1700s. Island culture is heavily influenced by the African roots of most of the Grenadians, but Indian and Carib Amerindian influence is also seen with dhal puri, rotis, Indian sweets, cassava and curries in the cuisine. The "oildown" is considered to be the national dish. The name refers to a dish cooked in coconut milk until all the milk is absorbed, leaving a bit of coconut oil in the bottom of the pot. Early recipes call for a mixture of salted pigtail, pig's feet (trotters), salt beef and chicken, dumplings made from flour, and provision like breadfruit, green banana, yam and potatoes. Callaloo leaves are sometimes used to retain the steam and for extra flavour. As with other islands from the Caribbean, cricket is the national and most popular sport and is an intrinsic part of Grenadian culture. The Grenada national cricket team forms a part of the Windward Islands cricket team in regional domestic cricket, however it plays as a separate entity in minor regional matches, as well having previously played Twenty20 cricket in the Stanford 20/20. An important aspect of the Grenadian culture is the tradition of story telling, with folk tales bearing both African and French influences. The character, Anancy, a spider who is a trickster, originated in West Africa and is prevalent on other islands as well. French influence can be seen in La Diablesse, a well-dressed she-devil, and Ligaroo (from Loup Garoux), a werewolf. Grenada has competed in every Summer Olympics since the 1984 Summer Olympics in Los Angeles. Kirani James won the first Olympic gold medal for Grenada in the men's 400 meters at the 2012 Summer Olympics. Cricket is one of the most popular sports of Grenada, with intense inter-island rivalry with its Caribbean neighbours. Devon Smith, West Indies record holder to win the List-A West Indian domestic competition for the second time, was born in a small town of Hermitage. This legendary West Indian batsman is one of the most famous sporting icons in the country. ^ a b c d e f "Grenada". The World Factbook. Central Intelligence Agency (CIA). Retrieved 2012-03-19. ^ "Grenada Nutmeg - GCNA - Organic Nutmeg Producers, Nutmeg Oil - Nutmeg trees - Nutmeg farming in Grenada". Travelgrenada.com. Retrieved 2012-03-19. ^ Anthony Payne, Paul Sutton and Tony Thorndike (1984). "Grenada: Revolution and Invasion". ^ Gailey, Phil; Warren Weaver Jr. (March 26, 1983). "Grenada". New York Times. Retrieved 2010-07-11. ^ "United Nations General Assembly resolution 38/7". United Nations. November 2, 1983. ^ "Assembly calls for cessation of "armed intervention" in Grenada". UN Chronicle. 1984. ^ Richard Bernstein (October 29, 1983). "U.S. VETOES U.N. 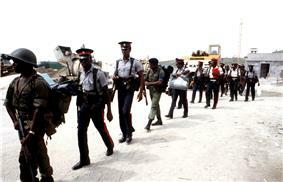 RESOLUTION 'DEPLORING' GRENADA INVASION". ^ "Grenada: Bandleader Loses Job in Chinese Anthem Gaffe". ^ Font size Print E-mail Share 7 Comments By Scott Conroy (2007-02-03). "Taiwan Anthem Played For China Officials". CBS News. Retrieved 2010-06-28. ^ "The 10 Best Beaches in the World". The Daily Telegraph (London). ^ "Oil down - National Dish of Grenada". Gov.gd. 2010-03-05. Retrieved 2012-03-19. "Grenada Heritage". Grenadaheritage.com. Retrieved 2010-06-28.